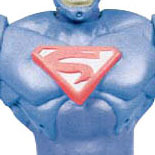 TimBurton.jp got a hold of a couple photos of a Superman Lives toy prototype. 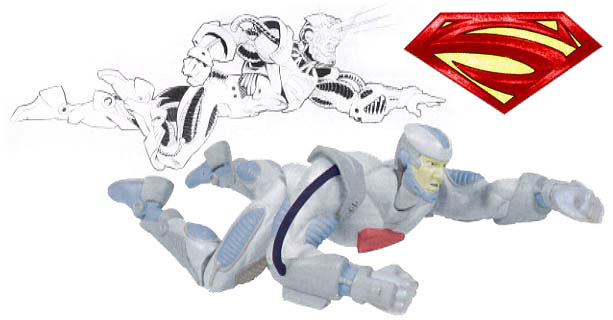 The prototype shows off the recovery suit/reborn Superman mech suit. It’s not pretty, but it shows how far along Hasbro was at the time with their toy designs. If you browse around the site, you will see a lot of previously seen concept art and test photos from the movie that, thankfully, never came to be. The movie was to be directed by Tim Burton and was to star Nicolas Cage as the Man of Steel. Click the headline of the story for the pics of the prototype. it kinda actually does look like cage. Because he read the script. That's also why he's flying away. Anyone see that "An Evening with Kevin Smith" thing he did? He talks about trying to write a Superman script, and how the producer was a complete tool. Apparently the guy lived in his own coked out version of Wayne Manor, and demanded that the Spiderman script include a giant spider. The expression on his face is exactly how I feel about this toy. Anti-Monitor Nick Cage? And Warner Bros. passed? Well, at least they made a Ryan Reynolds Green Lantern movie... No wait, that sucked, too. Truthfully i doubt it coulda been as craptacular as Superman Returns. At least it woulda been soemwhat creepy (as burton nomatter what manages to throw some creep in all his works) lol. Honestly, other than the head, I like it. I'm still glad the movie never had a chance to make it, but I also don't think that every idea they came up with should be ignored. Wow. Sweet, when does this come out? Headsculpt reminds me of original tron and he body reminds me of 1 of the bad guys from "The running man" movie. Where the hell's his cape?? I'll tell you what I think of that toy... I'd live to see them eat it, but I hope they leave enough room for my fist, because I'm going to ram it into their throat and rip out their goddamned spine!!! It isn't. This is from the canceled Superman Lives movie from the mid-1990's. 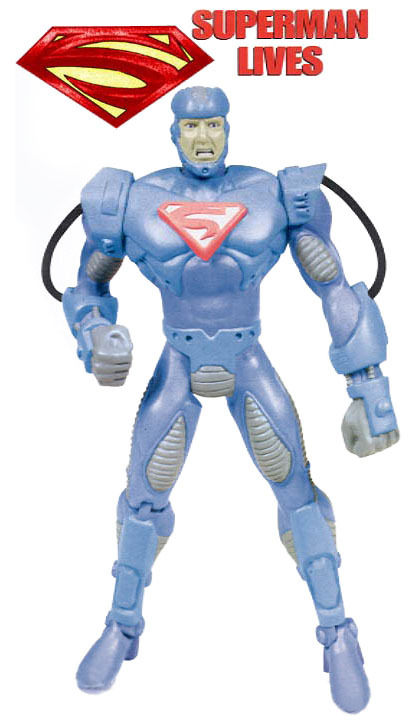 Subkect matter aside, it's a solid toy for the time- ankle articulation on a Superman is still rarely seen today. Sculpting is pretty solid by those standards too, for a movie toy. Seeing this made me think that Cage isn't the real comic fan I thought he was. No true Superman fan would be ok with this mess. It's not like the guy was hurting for work either. Glad someone came to their senses and canned this crap. Wow. So glad this did not happen. I remember the news announcing the next Superman movie with Nicholas Cage. We were all like, WHAT THE HELL? Robocop + War Machine = one hot mess. Je..sus! lol its so horrible. According to all the stories, some from him, some from Kevin Smith, some from other sources, Cage *wasn't* okay with this. He was harshly opposed to this take, and fought pretty hard to keep it truer to the original sources. Rumor goes that Burton made a rediculous version of the original costume (Basically, not something film worthy, like the other Superman movies), to "show him how stupid the original costume looks." From my understanding, Cage was one of the first people to drop out. That aside, it's more than a little unfair to blaim the actors for the decisions of the directors and producers, when it comes to costume design. That video shows some of the designs, as well as Nic Cage's regular costume test.